Scientists from Russia and Australia have proposed a simple way of counting microscopic particles in optical materials by means of a laser. A light beam passing through such a material splits and forms a characteristic pattern consisting of numerous bright spots on a projection screen. The researchers found that the number of these spots corresponds exactly to the number of scattering microscopic particles in the optical material. Therefore, the structure and shape of any optical material can be determined without resorting to the use of expensive electron or atomic-force microscopy. According to the researchers, the new method will help design optical devices much faster. The work was published in Scientific Reports. The production of optical circuits requires devices that can amplify optical signals, bring them into focus, rotate and change their type of motion. Ordinary lenses cannot cope with these tasks at nanoscale, so scientists are working with artificial optical materials—photonic crystals and metamaterials, which can control the propagation of light in extraordinary ways. However, fabricating optical materials with desired properties is a laborious process that needs improvement. The scientists from ITMO University, Ioffe Institute, and Australian National University have suggested analysing the structure of photonic crystals using optical diffraction—that is, by looking at the light pattern generated when the sample is exposed to a laser beam. The study has shown that the number of spots in the pattern is equal to the number of scattering microscopic particles in the sample structure. Previously, such small particles could only be seen and counted with powerful and expensive electron or atomic-force microscopes. "The light senses heterogeneity," says Mikhail Rybin, first author of the paper, senior researcher at the Department of Nanophotonics and Metamaterials at ITMO University. "Depending on the shape and relative position of the scatterers, the light wave continues to propagate differently behind the sample. In other words, the structure of the sample affects the diffraction pattern, which will be projected on the screen. We found out that it is possible to determine the precise number of scatterers in the material. 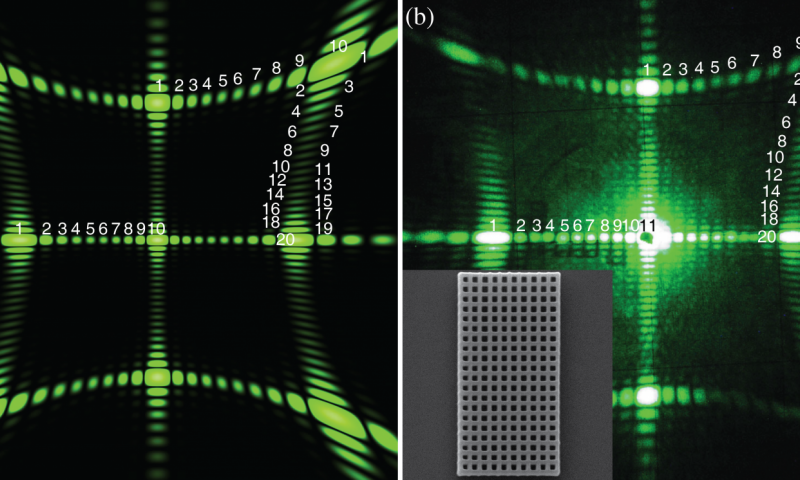 This helps understand not only the type of the sample lattice (square, triangular), but also to establish its structure (20 to 20 particles, or 30 to 15) just by counting light spots on the screen." The new method is a much more affordable alternative to expensive electron or atomic-force microscopy and in this case, does not spoil the sample. "Even a schoolboy can buy a laser pointer, adapt a small lens to focus the light better, fix the sample and shine a laser beam on it," notes Mikhail Rybin. "In addition, our method makes it possible to study optical materials without changing their structure in contrast to electron microscopy, where the sample surface has to be covered by a conductive metal layer, which impairs optical properties of the sample." The new method has already enabled scientists to investigate the transition between two main classes of optical materials: photonic crystals and metasurfaces. In the study, they have determined the lattice parameters, which define whether the light perceives the material as a two-dimensional photonic crystal or a metasurface. In both classes, the scattering particles (rings, balls, cylinders of 200 to 300 nm) are arranged in a flat lattice. However, with a two-dimensional photonic crystal, the light perceives the sample as a set of separate particles and generates a complex pattern on the screen behind the sample. Metasurfaces appear homogenous via the technique—the screen shows a single bright spot, indicating that the scattering particles are located close enough to each other that the light does not register separate particles and passes through the sample without splitting. In order for the light beam to pass through a metasurface, the distance between the particles has to be smaller than the wavelength of light. For some structures, it is necessary to produce a lattice in which the distance between particles is two to three times smaller than the light wavelength. Often, however, meta-properties can manifest themselves at larger distances between the particles. It is important to find the maximum allowable distance, since reducing the structure by one single nanometer makes the technology more expensive. For the light with a wavelength of 530 nm (green color), the distance of 500 nm between the scattering particles is already enough. "A green light beam perceives the structure with a period of 500 nm as a homogenous material. Therefore, it is not always necessary to fabricate a lattice with a period smaller than the wavelength, because producing larger structures is much easier from technological standpoint. For one wavelength, the material will act as a photonic crystal and as a metasurface for another. That is why designing such structures, we can evaluate maximum lattice period with laser," concludes Mikhail Rybin.